With 5 kids, I’m becoming more and more averse to entering actual stores to do my Christmas shopping. I mean, why would I when I can do so much of it from the comfort and relative safety of my home? (Not that we’re entirely safe from incidents that involve broken ornaments + massive toe cuts around here…ahem). Probably my favorite online one-stop shop is Amazon. We have a Prime account, which means free 2 day shipping on gobs of super-cute stuff, which is good. And bad. Depending on how spend-happy you get. Fortunately, I can usually control myself, but last night, as I was hunting for something specific (cute ceramic measuring cups…you’ll see in a minute that I found more than one set), I decided to keep looking for a while to see what great deals I could rustle up for you too! Not all qualify for Amazon prime, but either way, I’m not using any Amazon affiliate links, so I’m only recommending these things because I would buy them for myself or someone I love. I’ve broken down my items into 3 different price categories, without ever exceeding $50, so you can pretty much find something in a reasonable price range for any girl in your life! Note: I’ve tried to point out when an item only has a few in stock, but if you see something you like, I would hop on over and see for yourself since quantities can change quickly. Also, be aware that prices can fluctuate, so they may not be exactly what I listed them as by the time you get there if you don’t hurry! First up, here are 10 fun items with totals under (some waaaaaay under) $15. 1. (Blue) Ball Heritage mason jars, set of 6—awesome reviews! ($9.89 + free Prime shipping). I have these, and I absolutely adore them. They’re my favorite thing to use for small bouquets, for entertaining, or just to drink out of when I’m feeling a little fancy. 2. Home Basics bronze mug tree—great reviews! ($8.49 + free Prime shipping). I really need to order this. I’ve got mugs spilling out of my cabinets that would look way cuter displayed on the counter. (I’d be tempted to spray paint the bronze a fun color, though). 3. Polka dot scarf—lots of cute colors ($0.01 + $4.98 shipping). Love the green and coral, but I’d be tempted to get the tan/black too. 4. Botanicals notebooks—3 pack (8.64 + free Prime shipping) I stole these from Mandy’s awesome gift guide (they’re actually the inspiration for my Give Thanks painting); loved them so much I went ahead and ordered them. Total steal! 5. Paper straws + glitter pennants—lots of colors, pack of 25 ($9.80 + free Prime shipping). These would be so fun paired with the aqua mason jars. 6. Jessie Steel Ikat oven mitt—8 left in stock ($8.78 + free Prime shipping). Because oven mitts don’t have to look like your Great Aunt Bertha made them in 1973. 7. Nautical tea towels—set of two, 11 left in stock ($11.99 + free Prime shipping). These would look great for a small pop of color in a neutral or beachy kitchen! 8. Knit flower head wrap—several colors ($3.49 + $4.99 shipping). Didn’t see any reviews, so I don’t know how they’d hold up, but these are adorable. I’ll take one in every color, please! 9. Lace Headband ($2.95 + free shipping). No reviews for this one either, but for $3, it’s worth a shot! 10. Owl pendant ($0.98 + free shipping WHAT???). This is the mother of all necklace deals. I’m not really that into owls, but who cares? You could be trendy for one day and still get a good deal! 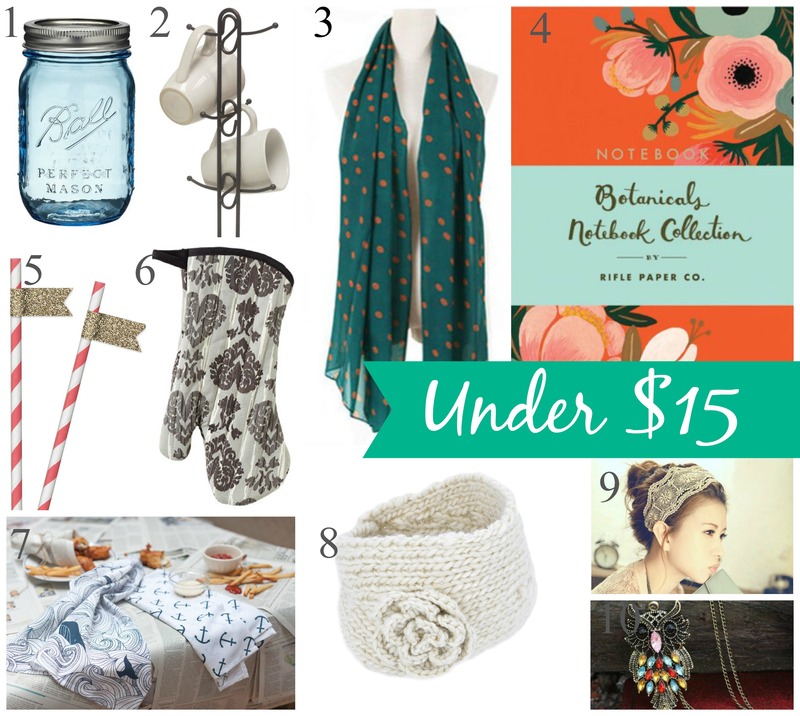 Next up, 11 deals for under $30! 1. Gracie China Dutch teapot ($25 + free Prime shipping). I already have a tea set I love thanks to my sweet hubby, but if I didn’t, I’d be tempted to snap this one up because of its bright colors and graphic blooms. 2. Fossil Wristlet (24.99 + free shipping). I have one of these, and it has held up well for almost 2 years now. It’s just big enough for a little cash, my debit card, and my phone and makes those times when I need to run into the grocery store but don’t want to haul my purse in with me less of a hassle. 3. Set of 6 large ceramic coffee cups ($29.95 + free Prime shipping). There are several color options, but I’m digging the polka dots! 4. Oxford booties—great reviews, 4 colors (from $28 + free Prime shipping). I’m not usually into oxfords, but I love the chunky heel on these and think they could look great with anything from a shirt dress to a knee-length, swingy skirt to skinnies to even trousers. (They’re usually over $75). 5. 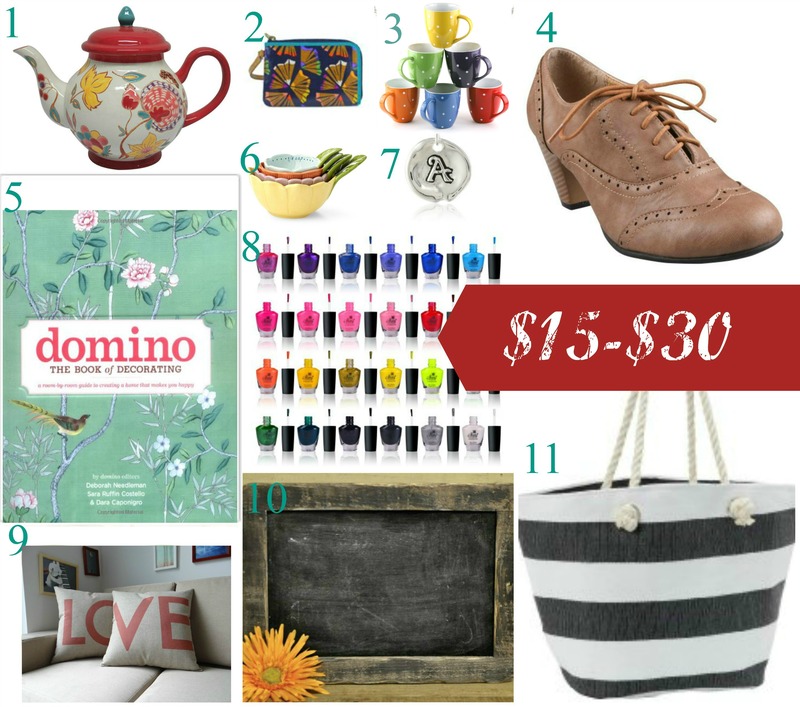 Domino: The Book of Decorating ($19.77 + free Prime shipping)—such a pretty coffee table book, and it looks like it has tons of great info and gorgeous pics. If you loved Domino mag like I did, I bet you’ll love this. 6. Floral measuring cups ($19.99 + $9.99 shipping)—these are definitely pricier than I’d like but soooo stinkin’ cute and tres Anthro chic! 8. SHANY cosmetics 24 color nail polish set ($25 + free Prime shipping). Full-sized bottles and almost 250 reviews and 4/5 stars! If you’re a polish junkie like me or know someone who is, this deal can’t be beat! 9. Love pillows ($19.99 + $4.89 shipping). What can I say but…LOVE!!! 10. Vintage Schoolhouse Framed Chalkboard ($19.89 + free Prime shipping), only 4 left—14”X 10”, great reviews! This would be awesome with a Christmas greeting drawn on it! 11. Magid paper straw striped tote—4 different colors ($18.39 + $2.95 shipping). The classic silhouette and stripes are so great! Finally, we get to the “pricey” stuff. I still think these are great deals, though! 1. Gracie China Dutch floral coffee cups—love the vibrant colors, only 8 left in stock! ($38.64 + free Prime shipping). These are a bit pricey per cup, but they’re still cheaper than their Anthro counterparts with a similar vibe. 2. Melie Bianco polka dot clutch—measures 13”X 5” and comes in a variety of colors ($29.99 + 4.95 shipping). I really love all things Melie Bianco (I’ve yet to see one of their bags I wouldn’t buy if I had an unlimited budget) but have never actually bought anything from them because they’re just a little too expensive. This clutch is usually over $65, though, and is actually quite large. My faves are the turquoise and the black + white from the pic. 3. Owl measuring cups + spoons ($24.88 + $6.99 shipping). Seriously? Does it get any cuter than these earthenware owl measuring cups and spoons? 4. Striped canvas London office tote—multiple colors with seven 5 star reviews ($49.99 + free Prime shipping). A Birkin bag knock-off that people actually think looks nice for less than $50? Suh-weet! My favorite is definitely the yellow. 5. Gold initial necklace with birthstone—looks amazing + great reviews! ($29.00 + $1.99 shipping). This is actually 14K gold-filled, and if the reviews and pics can be trusted, is really gorgeous for such a low price. My birthstone is the pink tourmaline from October, but I like it most paired with December’s dark turquoise stone. Appropriate for Christmas, no? 6. 18k Gold Plated Sterling Silver Monogram Necklace—fully customizable, great reviews! ($39.95 + $4.49 shipping). On a similar note to the necklace above, if you love monograms and want something that’s actually nice quality that won’t break the bank, this looks like a good option! 7. Fossil Retro Traveler watch in aqua ($49.99 + free shipping). This is an awesome deal if you love aqua as much as I do (although, I’ll be honest: the pics look teal). It’s usually $115. 8. Patterned wellies—various colors/patterns ($34.95 + $9.99 shipping). Hunter boots are adorbs and all, but I have a hard time justifying spending $150 on rain boots that I’ll wear maybe 6 times a year. These guys, though? Much cheaper and crazy cute. I can’t decide if I love the floral or the whales more! 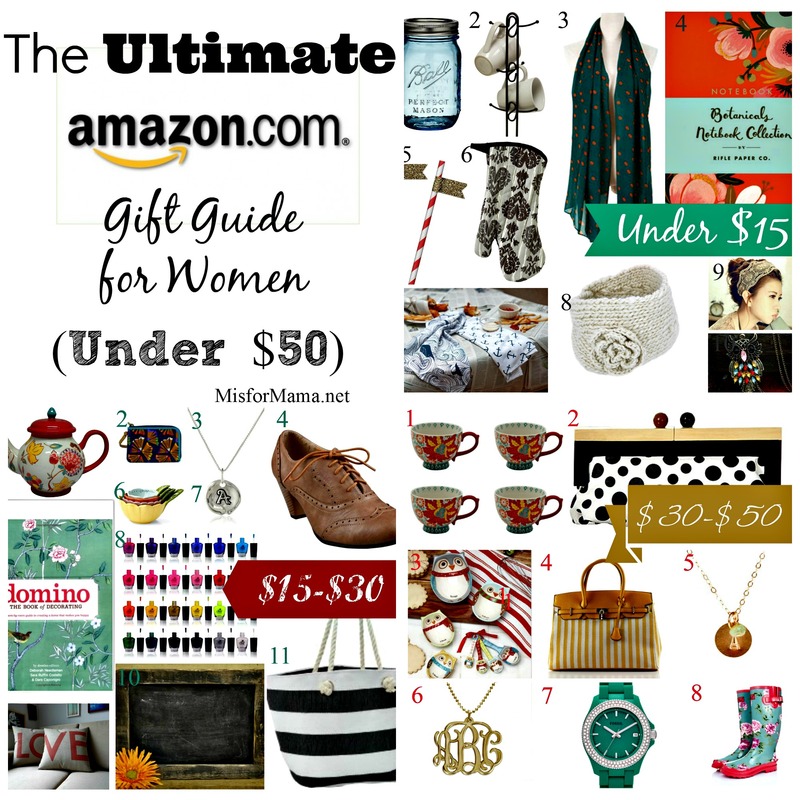 I know that was a lot, but hopefully I’ve given you some good ideas for things to buy for your sisters/aunts/cousins/besties/coworkers. I know I’m all set! So, what about you guys? Do you prefer to shop online or in the actual stores? My answer depends entirely upon how many children I have with me. Any favorite online finds you’d like to share? I’ve actually gotten some great deals from Day Spring (I may share soon) recently and am looking forward to giving them as presents. 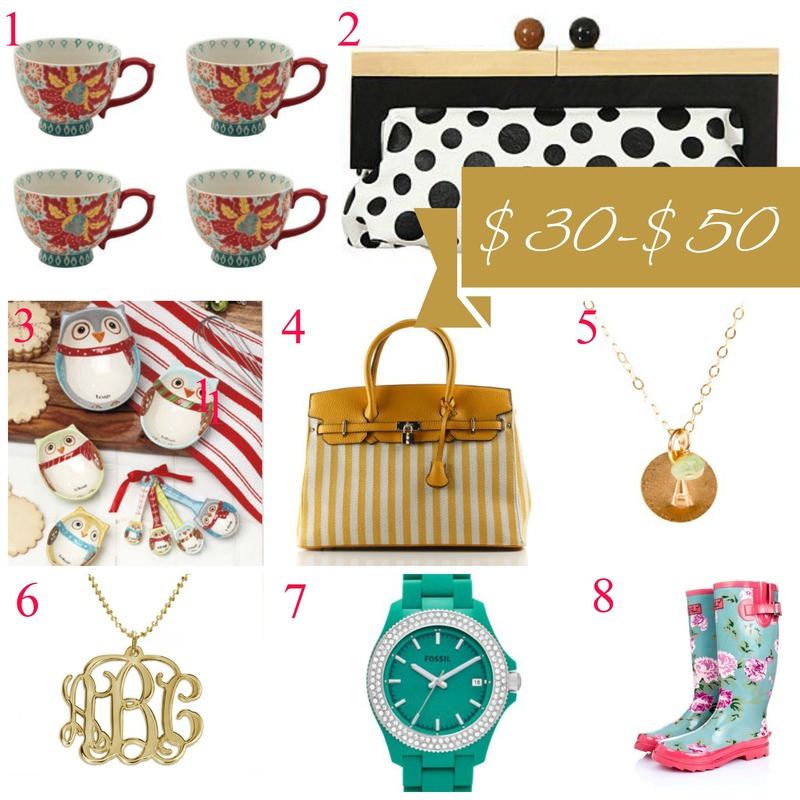 Are you done with your Christmas shopping or are you a wait-till-the-last-second type (or somewhere in between)? I usually get my shopping done in a decent amount of time, but I’m definitely a last-minute wrapper. I have bought a TON of cheap cheap cheap jewelry that ships from overseas for under $1.00. Most of it’s been fantastic and makes a great gift! Thanks for offering some less expensive options! I have that $0.98 owl necklace and it’s SO CUTE!!! Every shipping-from-china necklace I’ve bought (under $1 all of them, I think) has been adorable and I’ve loved them! Abbie! Good news! Domino is back in print. It’s online and printed quarterly, but the first one came out in October. This is such a great list. One of everything please!